So we made it through Thanksgiving relatively unscathed. (Or maybe you didn’t… don’t beat yourself up; get back up!) Just when we think we’re safe and getting back into our routine, the holiday invites start rolling in. Parties here, family gatherings there, co-workers bringing in tasty treats. 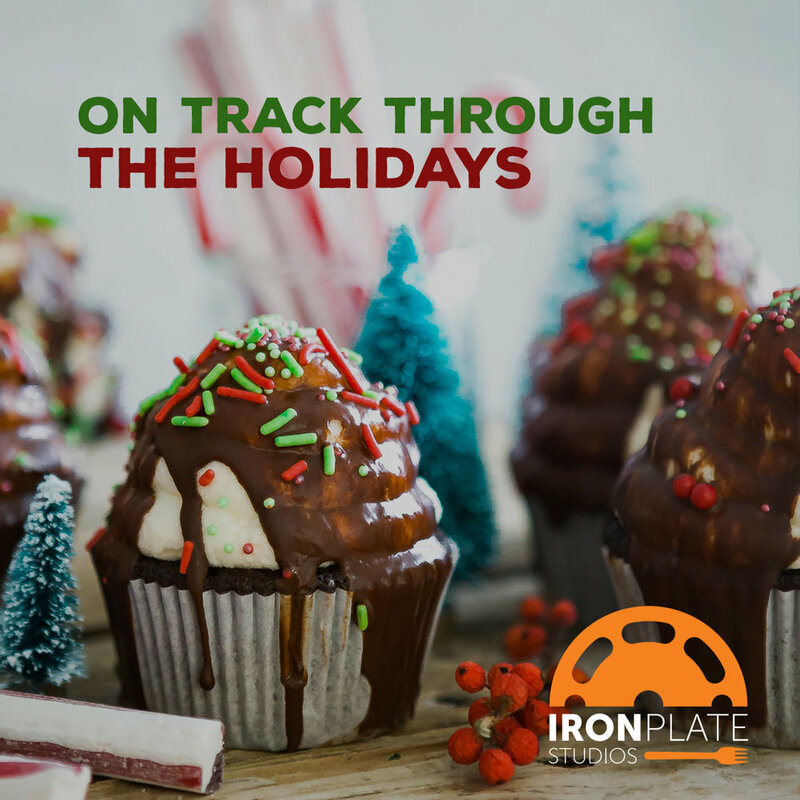 It’s easy to feel overwhelmed and fall back into that all or nothing mentality, but it’s important to remember you have a strong support system here at IronPlate and are capable of enjoying your holidays while sticking to (or close to) your healthy routine. Let’s focus on adjusting your routine and mentally preparing for the holiday season. Perhaps you normally have an hr to devote to your workout, but now you’re wondering when you will sleep let alone workout. We get it. There’s shopping and preparing to be done and events to attend, there just aren’t enough hours in the day. Just because you can’t commit to the full hour now doesn’t mean you can’t do anything. You can cut the length of your workouts by increasing your intensity. Try a 15 minute workout before you jump in the shower for the day. Take 15 min on your lunch break and get the blood moving. Keep an eye out on our Instagram and FaceBook pages for some quick workouts to get you through the holidays. You may not be a morning person but for a short time you can do anything! Just knowing you don’t have to get up early forever helps, especially if it means you’re continuing to work toward your goals. That early morning workout also give you time to yourself before the hustle and bustle of the day begins. Speed walking from store to store. Park as far away from the entrance as possible. Shop local. Go into your town and walk shop-to-shop to find the perfect gift. You’ll get fresh air, have fewer crowds, be able to take in the holidays decor and be getting some exercise! Just because it’s cold and snowy out doesn’t mean our outdoor fun has to stop! Sledding, ice skating, snow shoeing, skiing (downhill and cross country) are all family friendly activities that require some fitness. Still not into going outside? Try some more active board games like: Charades, Twister, scavenger hunt, Cranium Hullabaloo, Hopscotch, or dust off that Wii you haven’t used in years, etc. If you have a slew of parties to attend, pick your favorite to splurge on, and be on point for the rest. One event won’t throw you off, but continuous indulgences will. Scout out the food before taking your plate and decide what will be worth it to indulge on and what you should pass on. This way you’re not loading your plate the first time you see everything. Take time to mingle and enjoy friendly conversation before going back for more food. Listen to your body — are you truly hungry? Eat normally leading up to an event or occasion and drink LOTS of water. Holidays are NOT about the food. They are about spending time with people you care about. Take time to reflect on why the holidays are important to you and what else you enjoy about them (besides the tasty treats). Remember that and enjoy the conversations and activities with friends and family. You’ll be surprised at how quickly you forget about the temptations. Above all, don’t let your fitness and nutrition add to the list of things to stress you out this season. The more you plan ahead and make peace with the decisions you make, the less likely you’ll be to completely fall off the wagon. Reach out to your trainers or peers for help if you need it!